LawyerServices is the only comprehensive legal solution available in India. It is a unique portal, that serves the legal community from all spheres of life, with assistance tools & services to simplify their lives. LawyerServices makes mundane tasks more fun, easy and accurate. Besides providing assistance and helping to maximize productivity, it also helps makes things more interactive, involving and enjoyable for all those associated with you. 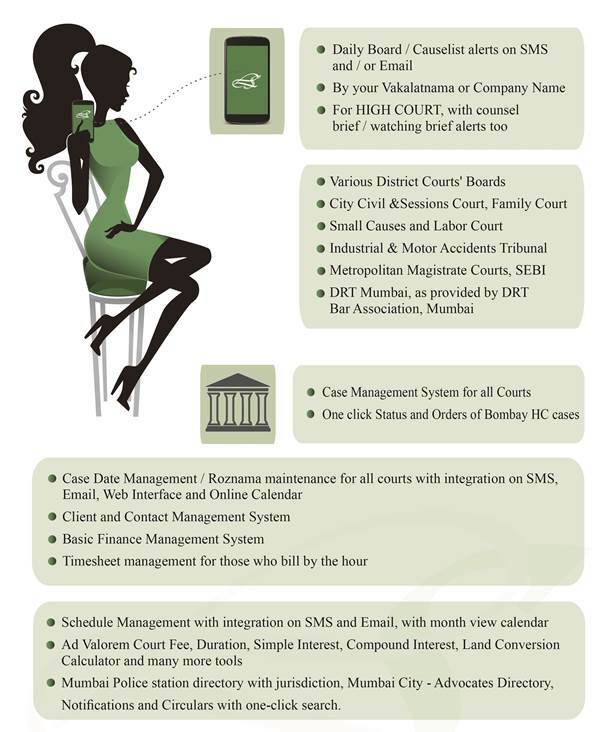 All legal professionals (with or without litigation), normally require our core services which include a) Daily alerts on SMS and Email of matter listings in various courts; b) access to Acts, Rules, Amendments & Forms and; c) Access to Judgments or Case Laws of Indian (and some international) courts. 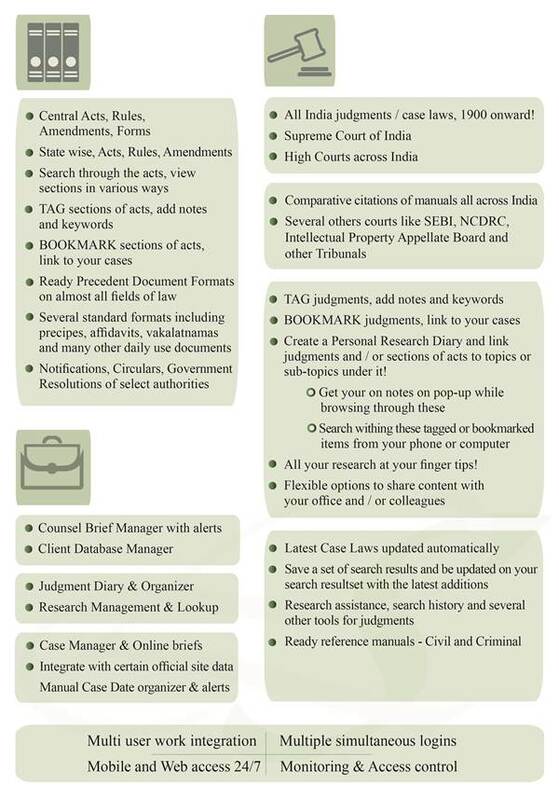 Tools to assist your legal work include ready pre-set document formats on all fields of law, references to meanings and case laws for legal terms, topic-wise assortment of landmark court decisions, YOUR own research area to create topics / link items / put notes / search through research etc, Case Diary Manager, Digital brief creation, Calculators for legal work & court fees, Live matter position alert on sms for BomHC, Notifications, Circulars, Ordinances, Government Resolutions, Gazettes, Police Station Directory, and many more! LawyerServices is a portal soft-launched in 2008, with complete operational, sales & marketing functions started, on 27th January 2009; which is currently celeberated as the anniversary of LawyerServices. This is a service started by a young and dynamic team. We are a blend of techies with management backgrounds and have with us professionals legal, engineering, management, support, sales and / or other backgrounds. We pride ourselves in having fabulous PERSONAL connect and a unique rapport with our clients. Since almost all of our technical and legal capabilities have been in house, we are able to take client inputs and customize some specific aspects to their needs. This gives us a unique edge over any other competitor. The initial tag line of LawyerServices read, "Everything a Lawyer needs". The intent always was, to provide technical capability, assistance and ease to any legal professional. Since 2008, there have been dozens of features added to the system! The plan is to be able to provide each and every person a customized experience, with a base of the original LawyerServices service. That way, everyone can derive benefits of the LawyerServices system, as well as have aspects of the system customized to suit their needs. This unique approach has already made us a hit with some of the major law firms, corporate houses and government departments in Asia!